King's College London - Inaugural postdoc network alternative careers event "brilliant"
Home | Institute of Psychiatry, Psychology & Neuroscience | News, Events & Engagement | News stories | Inaugural postdoc network alternative careers event "brilliant"
During PhD study, students are expected to spend a proportion of time training and developing ‘transferable’ skills, but just how transferable are they? The award of a PhD represents a highly advanced piece of academic work, but does this mean that an academic career is the only option? 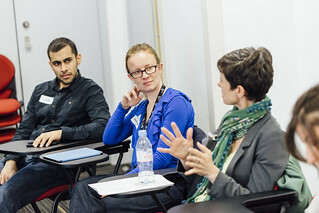 The IoPPN Postdoc Network Committee sought to provide answers to these questions by providing a unique opportunity for postdocs to meet and interact with individuals that have first-hand experience of life outside academia. In this “speed-dating” style event, delegates were divided into groups and met with individuals that have completed a PhD but subsequently moved outside of academia, into the varied domains of industry, scientific publishing, charity, policy, media, technical sales, start-up companies, teaching and academic support. Speakers included the editor and deputy editor of Lancet Psychiatry, the 2014 winner of the ‘Media Personality of the Year’ King’s Award, and representatives from the King’s Fund, the National Audit Office and the new government initiative, Catapult. Delegates were provided with speaker biographies in advance and a member of the IoPPN Postdoc Network Committee was present in each group to stimulate and encourage interactive discussion during each of the 10 minute sessions. The speed-dating event was followed by a drinks reception and informal networking session with the speakers. The ultimate aim of this event was to educate postdocs, make them aware of the opportunities that are available to them, and to facilitate and encourage the support of early-career staff in their professional development, whether that be in academia or not. Beyond career benefits, an increased awareness of how different sectors outside academia operate is likely to enhance understanding of the wider impact of academic research. The success of the event is reflected in the delegate feedback which has described the event as “brilliant (and) much needed” and “impressive”. One delegate noted, “I’ve been to career events at prior universities and the speakers weren’t nearly as varied as this”. Overall, 83% of delegates rated the event as either ‘extremely’ or ‘very’ relevant to them, and 85% rated the event overall as ‘extremely’ or ‘very’ good. The feedback confirms the need for a clear framework which both encourages and enhances the career development of early-stage researchers, and promotes a supportive and collaborative environment across all academic and non-academic disciplines. For further information on the IoPPN Postdoc Network, please visit our webpage or follow us on Twitter (@IoPPN_Postdocs). Men and women with a pre-existing mental disorder are two to five times more likely to have experienced emotional, physical or sexual violence at the hands of their partner than those without a mental illness, according to new research from the Institute of Psychiatry, Psychology & Neuroscience (IoPPN) at King's College London.